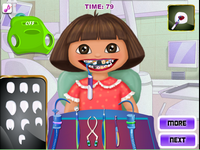 You are dentist who is help for enormous goriilas.If you like veterinary game, probably you will like Gorilla Dentist Game. Your memory is very important for this game. Never pass the black teeth without using the cures. Have Fun.